Have you ever wished you could ride alongside Hiccup and Astrid on the back of a dragon, soaring high in the sky and swooping over incredible landscapes? Walmart (NYSE:WMT) and DreamWorks Animation are making this a reality – a virtual reality – through an exclusive, first-of-its-kind immersive V-commerce activation tied to the upcoming theatrical release of How to Train Your Dragon: The Hidden World. Just ahead of the highly anticipated film hitting theaters nationwide on February 22, the How to Train Your Dragon: The Hidden World Virtual Tour, powered by HP, Intel and Positron, will visit select Walmart parking lots. Spatial&, a V-commerce startup focused on creating next generation merchandising experiences using cutting-edge technology and storytelling tools, collaborated with DreamWorks Animation to create this unique VR-driven shopping event designed to foster one-on-one relationships with the film's famous characters. As part of this, the tour will feature How to Train Your Dragon merchandise available for purchase in a branded, immersive gift shop. The experience, directed by Kurt Mattila and Gil Zimmerman and produced by Armand Weeresinghe, begins in an onboarding room where the film's mischievous twins Ruffnut and Tuffnut greet guests, setting the scene for this magical adventure. Participants are then led into a dragon's cave to suit up in headsets, and sit in specialized Positron motion VR chairs powered by the HP VR backpack, before embarking on a truly life-like five-minute journey through the breathtaking Hidden World with the help of Astrid, Hiccup, Toothless, Hookfang and more. This remarkable activation gives everyone, ages 8 and up, the opportunity to interact with How to Train Your Dragon characters through immersive real-world sound, motion and sensory cues. Viewers are drawn fully into the experience physically and emotionally, creating deep bonds with the dragons and characters they encounter along the way. "Collaborating with DreamWorks Animation and its iconic How to Train Your Dragon franchise is such an exciting way to bring Spatial&'s first ever activation to the public," said Katie Finnegan, chief executive officer of Spatial&. "Spatial& was founded based on the belief that VR will transform merchandising and retail and we can't wait to finally share this uniquely immersive shopping experience with consumers across the country." "We have set an extremely high bar for quality and innovation for the How to Train Your Dragon franchise, and our partners at Spatial& exceeded our expectations with their incredible work on this project," said Abhijay Prakash, chief operating officer of DreamWorks Feature Animation. "This latest Dragon film displays DreamWorks' best in class creative abilities combined with state of the art advances in animation technology, and we are thrilled that this experience created by Spatial& lives up to that reputation while allowing fans to journey straight to the center of this unique world we've created for the film. It's a truly exhilarating experience." "The How to Train Your Dragon: The Hidden World Virtual Tour is a great opportunity for our customers to engage with this fantastic franchise. It's also the most recent example of how Walmart continues to use emerging technologies, including virtual reality, to enhance the experiences of shoppers across the country," said Scott McCall, senior vice president for entertainment, toys and seasonal, Walmart U.S. "Customers will also get a preview of the exciting new products available at Walmart for How to Train Your Dragon fans of all ages at the great prices customers expect from Walmart." 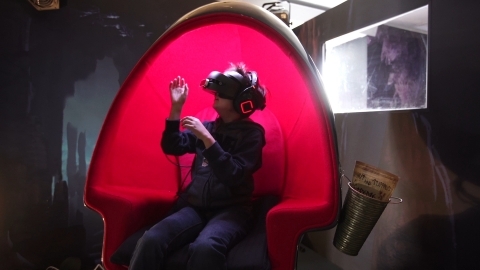 Following the VR experience, participants are guided into a How to Train Your Dragon themed gift shop where they can purchase memorabilia featuring the characters they befriended and created deep connections with during the activation. Items for sale include everything a little Viking might want, from plush toys to action figures to franchise DVDs and video games. Select merchandise from the collection will be available in 2,000 Walmart stores nationwide and at http://walmart.com/dragonstourwalmart. The entire activation is brought to life through top-of-the-line hardware and software from HP, Intel and Positron, official sponsors of the tour. Spatial& and DreamWorks Animation leveraged servers and workstations powered by Intel® Xeon® Scalable processors to stitch together high-resolution images and 360-degree VR videos to create this stunning experience. During the activation, HP Windows Mixed Reality Headsets and OMEN by HP Mindframe Headsets, alongside PCs powered by Intel® Core™ processors, make it possible for consumers to fully step into and enjoy the Hidden World. The fun continues outside the VR experience where HP Chromebooks allow parents to follow along with the content their children are viewing and Omen by HP Gaming Laptops, based on Intel technology, provide entertainment for waiting participants and passersby. "For 80 years, HP has delivered innovative technology to help filmmakers create memorable moments," said Joanna Popper, global head of virtual reality for location based entertainment at HP Inc. "Working together with DreamWorks Animation, Walmart and Intel, we are using virtual reality to take the Hidden World from storytelling to story-living by bringing audiences to the center of the narrative." "Intel's end-to-end solutions together with technology from HP and the creative minds from Spatial& and DreamWorks Animation have brought to life new, immersive cinematic experiences for audiences to connect with the How to Train Your Dragon world," said Kumar Kaushik, general manager of AR/VR solutions, client computing at Intel. "From the imaginations of content creators to taking a VR journey on the back of a dragon, technology is unleashing new storytelling possibilities for developers and consumers alike." "How to Train Your Dragon: The Hidden World Virtual Tour leverages Positron's Voyager® VR motion chair to deliver a magical, multi-sensory encounter where viewers can enjoy hands-on interaction with their favorite characters from the film," said Jeffrey Travis, CEO of Positron. "Spatial& is our first client to introduce interactive hand tracking along with 6DOF (6 degrees of freedom) in our Voyager® chair. We can't wait for audiences to experience this new level of immersive storytelling, and we are proud be a part of this groundbreaking project." Walmart Inc. (NYSE:WMT) helps people around the world save money and live better - anytime and anywhere – in retail stores, online, and through their mobile devices. Each week, nearly 265 million customers and members visit our more than 11,200 stores under 55 banners in 27 countries and eCommerce websites. With fiscal year 2018 revenue of $500.3 billion, Walmart employs over 2.2 million associates worldwide. Walmart continues to be a leader in sustainability, corporate philanthropy and employment opportunity. Additional information about Walmart can be found by visiting http://corporate.walmart.com, on Facebook at http://facebook.com/walmart and on Twitter at http://twitter.com/walmart. Spatial& is a V-commerce startup focused on creating next generation merchandising experiences. Spatial&'s team of storytellers, technologists and retail experts believe VR's ability to fuse the emotional bonds between consumers and brands has the potential to reinvent the customer journey. It is the second portfolio company to launch from Store N°8, Walmart's incubator dedicated to uncovering ideas that will transform the future of commerce. DreamWorks Animation (DWA), a division of the Universal Filmed Entertainment Group, within NBCUniversal, a subsidiary of Comcast Corporation, is a global family entertainment company with feature film and television brands. The company's deep portfolio of intellectual property is supported by a robust, worldwide consumer products practice, which includes licensing, and location-based entertainment venues around the world. DWA's feature film heritage includes many of the world's most beloved characters and franchises, including Shrek, Madagascar, Kung Fu Panda, How to Train Your Dragon, Trolls and The Boss Baby, and have amassed more than $14.5 billion in global box office receipts. DreamWorks Animation's television business has quickly become one of the world's leading producers of high-quality, animated family programming, reaching consumers in more than 190 countries. Creating a diverse array of original content in a variety of formats and delivering deep, fully immersive worlds served up with compelling characters, the prolific studio has garnered 22 Emmy? Awards since inception in 2013. HP Inc. creates technology that makes life better for everyone, everywhere. Through our product and service portfolio of personal systems, printers and 3D printing solutions, we engineer experiences that amaze. HP's virtual reality technology is founded upon our rich history of product innovation and deeply rooted customer relationships which enables us to deliver the most immersive technologies that help businesses lead their industries. OMEN by HP products provide the performance and enthusiast gaming community with the tools needed to enjoy their favorite titles and excel in esports. Positron is a studio focused on cinematic VR. Based in Los Angeles, the team includes filmmakers, mechatronics engineers, designers, software developers and artists who collaborate together to create premium VR experiences and products. Positron works with companies such as Universal Studios, Disney, DreamWorks, Verizon, Intel, and many more to deliver cinematic VR experiences on Voyager®, its award-winning, full-motion VR chair platform that has been called "the future of movies." Integrating beautiful design and high-end engineering, the chair reflects a passion for VR storytelling. Voyager® delivers a completely new level of immersion in VR by providing a comfortable, fully integrated personal VR theater that incorporates whisper-quiet robotic rotation and pitch motion, audio-driven haptic feedback, scent dispensing, cabin lighting and specialized seating. Voyager® VR cinemas are available now for cinemas, museums, and events that desire to provide a premium VR experience.